We supply Forged Flanges and Plate Flanges in Carbon Steel, Stainless Steel & Alloy Steel of the highest quality materials. ​PN6, PN10, PN16, PN25, PN40, PN64, etc. Nickel 200 (UNS No. N02200), Nickel 201 (UNS No. N02201), Monel 400 (UNS No. N04400), Monel 500 (UNS No. N05500), Inconel 800 (UNS No. N08800), Inconel 825 (UNS No. N08825), Inconel 600 (UNS No. N06600), Inconel 625 (UNS No. N06625), Inconel 601 (UNS No. N06601), Hastelloy C 276 (UNS No. N10276), Alloy 20 (UNS No. N08020), Titanium (Grade I & II). Flanges are generally used when there is a connection to valves, in-line instruments and/or connection to equipment nozzles is required. Flange fittings generally involve pressing two surfaces to be joined tightly together, by means of threaded bolts, wedges, clamps, or other means of applying high compressive forces. Often, a gasket, packing or an O-ring is installed between the flanges to prevent leakage, but it is sometimes possible to use only a special grease, or nothing at all, if the mating surfaces are precisely formed. ​Blind Flange is round plate which has all of the relevant boltholes but no centre hole, and because of this feature this flange is used to close off the ends of a piping systems and pressure vessel openings. It also permits easy access to vessels or Piping systems for inspection purposes. Weld Neck Flange have a long tapered hub and are often used for high pressure applications. These flanges are designed to be joined to a Piping system by Bun Welding. The Neck, or Hub, transmits stresses to the Pipe, reducing stress concentrations at the base of the Flange. The gradual transition of thickness from the base of the Hub to the wall thickness at the Bun Weld, provides important reinforcement of the Flange. The bore of the Flange matches the bore of the Pipe, reducing turbulence and erosion. These flanges are ideal for extreme fluctuations of temperature and in environments where there may be high pressure or high temperature being dealt with. Slip-on Flange these are easily fitted and welded into different pipes. Slip on pipe flange is slipped over the Pipe and then welded both inside and outside to provide sufficient strength and prevent leakage. These flanges are ideal for lower pressure applications. This Flange is used in preference to Weld Necks by many users because of its lower cost and the fact that less accuracy is required when cutting pipe to length. Socket Weld Flange are attached by inserting the pipe into the socket end. This allows for a smooth bore and better flow of the fluid or gas inside of the pipe. 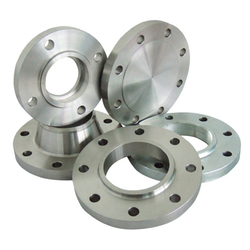 Socket-weld pipe flanges are mainly used for smaller sizes of high pressure pipes. Threaded Flange are similar to slip-on pipe flanges except the bore of threaded pipe flange has tapered threads. These flanges are ideal for relatively low pressure piping systems. Threaded flanges are used with pipes that have external threads. The benefit of these pipe flanges is that it can be attached without welding. Lap Joint Flange slide over the pipe and are most commonly used with Stub End Fittings. A pipe is typically welded to the Stub End and the Lap Joint pipe flange is free to rotate around the stub end. Lap Joint pipe flanges are often used for applications that require frequent dismantling. Threaded pipe flanges are often used for small diameter, high pressure requirements. Orifice Flange are used instead of standard pipe flanges when an orifice plate or flow nozzle must be installed. Pairs of pressure tappings are machined into the orifice flange, making separate orifice carriers or tappings in the pipe wall necessary. In addition to these we also supply Orifice Flange, Stub-end fittings, plate flanges, backup flanges, Beveled ID flanges and Reducing flanges.